Hello again! It's been a little while since my last blog post hasn't it? I was on fall break. A whole week off. Today is my second day back at school, which means this I'm way too tired. 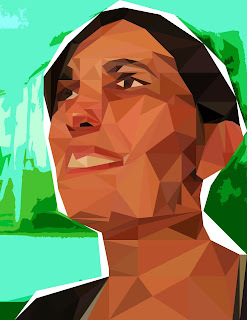 In GT we've been talking a lot about low-poly portraits. I'll get to what low poly is later, but for now I have to talk about portraits. Portraits focus mainly on the face of a person. Because of this, facial expressions are probably the most influential part of a portrait. Facial expressions are normally easily recognizable. Facial features rarely effect expressions. Most of the time, I think facial expressions are universally recognizable. I do know of one culture in which sticking out your tongue signifies how friendly you are, as opposed to the more common meaning, mockery. That is the only time I have heard of a non universal facial expression. 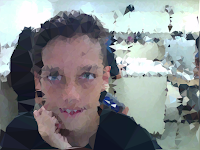 Low Poly is a term referring to the resolution of an image. Most pictures are high poly, which is what makes them clear. The photos are made up of many small polygons, or polygonal mesh. When there is a large number of polygons, that's called high poly. 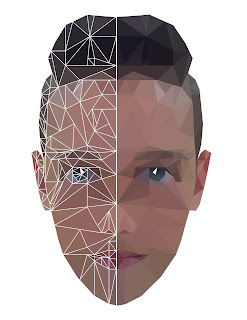 Low poly means there is a lower number of polygons, and you can see each individual polygon, almost always in the shape of triangles. 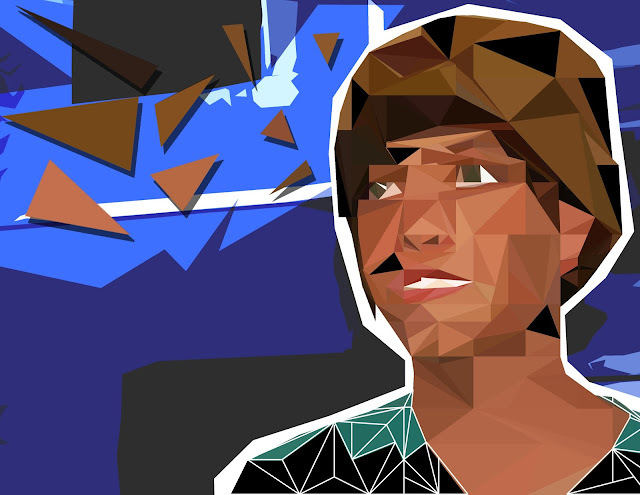 Using Adobe Photoshop, you can take a high poly image and give it a low poly effect. That's what we've been doing in class recently. The process isn't extremely complicated, but it is time consuming. If you're learning as I am, It is best to use a symmetrical photo. Put it into Photoshop, and copy that layer. Once the photo is in Photoshop, turn on your grid. Make sure it is an equal distance away form all four sides, then draw a line straight down the center. Use the line tool to outline half of your face. Make sure to include your hair, eye, nose, and ear. Each line should start and end on a line of the grid. Use the line tool to create triangles everywhere you see a different shape or skin tone. If large areas only have a few triangles, you can add to more to improve how it looks. Use the polygonal lasso tool to trace each triangle on the outer extremeties, one at a time. After tracing the first one, you go to filter-blur-average and select it. This adds to the low poly look, and adds a 3D touch. After that, you can press command-f for the same color effect. The last step is very simple. The best way to complete it is to click on the layer containing your low-poly face half, and drag it all the way to the opposite side to flip it. Connect it to the other side, and your done! In class, we have done two poly portraits so far. They are both different from each other. The first one is a symmetrical photo of us, taken with a low quality camera. The second one is an unsymmetrical photo of someone else, taken with a better camera. In the first one we are looking at the camera, and in the second the subject is looking away. We also used different techniques. For the first one, we drew thick lines on the photo where we wanted out triangles to be, then we made our triangles. We then used the average color in that triangle. To make it easier, we only did half of the face and then flipped it to make the other side. Because the second one wasn't symmetrical, we didn't do that. We also completely skipped the step of drawing the lines before our triangles, and we picked a color from each triangle and filled it with that instead of using the average color. On the first one, we left the thick lines i described before on it. The last difference is the background. For the first one, we selected and outline of our face, then turned it inside out, if you will. That means we selected everything around our face, then we turned it white. For the second one, we drastically edited the colors and shapes in the background of our original photo and used that. Here is an automatically generated or "easy" version made from a website.